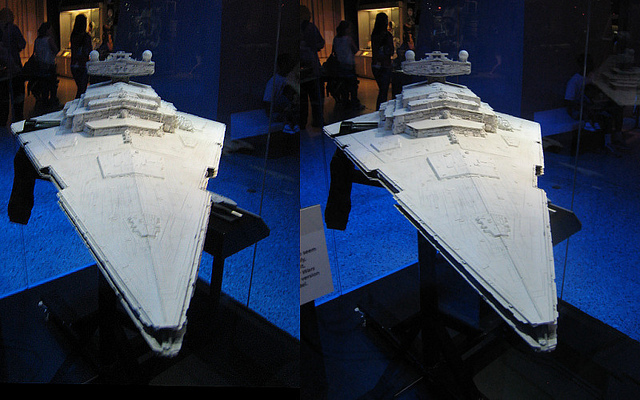 This Star Destroyer will reveal her three-dimensional majesty if you follow the instructions below, and your heart is pure. Photo by Booga Frito. You don’t need fancy lenses to view this picture in 3D, but you do have to be willing to look like an idiot for a few seconds. Take your pinky, index, middle, and ring fingers and cup them around your palm to form a tube. Do this with both hands, making sure your thumbs are out of the way. Put your right hand up to your right eye and point it at the left picture. Then put your left hand up to your left eye and point it at the right picture, making sure the whole ship is visible through each eye. Finally, let yourself go cross-eyed and watch the two images merge into one. That’s pretty much all there is to it. When your eyes view the same object at slightly different angles, your brain fuses both retinal images to create a sensation of depth. This process, termed stereopsis, has been known for centuries. In the mid-1800s, Charles Wheatstone caused more than a few monocles to drop into their respective champagne glasses with his stereoscopic picture viewer. Nowadays, with films like Avatar grossing more than the GNP of many small nations, it’s not surprising that many are taking a renewed interest in 3D technology. Just last spring, vision scientists and filmmakers at York University founded 3D Flic, a stereoscopic film research initiative destined to stake out Toronto’s own slice of the increasingly well-rendered 3D pie. Flic, whose snazzy acronym belies the rather awkward “Film Innovation Consortium,” is a partnership between academics and local film industry leaders, buoyed by $1.4 million in public and private funding. Flic aims to apply lessons learned in the lab to cultivate local 3D production capacity and filmmaking expertise. And there are certainly plenty of lessons to be learned. 3D is getting ready to leap off the screen (figuratively!) and onto our laptops, TVs, and cellphones, but a couple barriers still stand in the way of widespread adoption. Price is an obvious one—Panasonic’s fifty-inch 3D plasma retails for about $1,000 more than its non-3D counterpart, and the glasses will run you around $150 a pop. Beyond that, however, there are also some serious perceptual issues inherent in the nature of stereoscopic imagery itself. All visual media, at their core, involve a certain perceptual slight of hand. “To tell you the truth, even regular TV is very impressive,” notes Rob Allison, a stereopsis specialist at the York Centre for Vision Research and member of the 3D Flic research team. TV gives you a series of still, granulated 2D images, plus a smattering of low quality noise, from which your brain manages to perceive a coherent, lifelike scene. “We’re not just geometric machines,” Allison stresses. There is a lot of subconscious processing that goes on behind the basic math of 3D. Accommodation and vergence are two basic perceptual processes that can cause big problems for small displays: if you hold your hand a few inches in front of your face, your eye lenses will change shape slightly (or accommodate themselves) in order to bring your hand into focus. Your eyes will also rotate inwards (or converge) so that they point directly at your hand. If you turn your attention to an object that’s farther off in the distance, your lenses will re-accommodate and your eyes will diverge, almost instantaneously (or at least a whole lot faster than your crappy Coolpix digital camera). These two processes normally work together, but when you’re watching 3D, they get confused. Your eyes accommodate to the screen but converge and diverge to objects you perceive as being in front or behind. “For far distances this is not really an issue,” Allison explains, but if your screen’s nearer than a meter away—as it would be for most laptops and cell phones—you’ve got problems. 3D Flic was designed to study issues like these, and to work with local engineers and filmmakers to devise homegrown solutions. This kind of problem solving is as much an artistic process as it is a technical one, and exploratory filmmaking projects are one of Flic’s central activities. The Flic members we interviewed were all excited: this is the best time to be involved in 3D, because the expressive grammar of the medium is still being written. Ali Kazimi, lead filmmaker at 3D Flic, whose background is mostly in documentary cinema, became interested in 3D after getting his hands on some Victorian-era stereoscopic photography. “Stereo photography was a huge part of documenting the world in the Victorian and Edwardian eras,” he notes, but it’s only recently become feasible for the filmmaking community to make use of stereoscopy on such a large scale. Laurie Wilcox, vision specialist and another member of the 3D Flic research team, claims that the 3D films being made now are really, in effect, 2D films: they haven’t been conceived, written, shot, and edited in a way that’s fundamentally different from 2D films. She argues that the rapid-fire pacing of the conventional blockbuster is out of place in the 3D world, where the expansive visual space of each shot is waiting to be explored. And it’s not only about depth. The addition of shape to the filmmaker’s palette, Kazimi also notes, gives 3D cinema new expressive potential. Certainly the medium has its detractors. Among them is Roger Ebert, who’s called 3D “a waste of a perfectly good dimension.” Kazimi, on her side, draws parallels to the debate between colour and black and white film in the ’30s and ’40s. “For many black and white purists,” he says, “color rendered the world too realistically.” Strains of this same dialogue can even be found in the early days of photography. “Every time we go through a stage where representationally the world becomes a little more sharply or realistically rendered,” Kazimi explains, “the question becomes, is this really just a precise copy of the world?” And if so, where’s room for artistry? But while 3D may look realistic, if there’s one thing all the members we interviewed stressed, it’s that stereoscopic imagery is not an exact representation of the real world. Allison gives an example of aerial 3D photography during the World Wars. Planes would fly over enemy territory, snap a photo, then fly a few klicks further and snap another. When viewed through a stereoscope, which shines one image on each eye, the perceptual illusion is striking (think looking at the world through the eyes of a giant). Turns out this “hyperstereopsis” works great for sussing out camouflage that simply can’t be seen with the naked eye. The only thing reliably realistic about 3D may be its economic potential. At least that’s what Flic’s investors are banking on. Just last week, the Ontario Media Development Corporation (OMDC)—one of 3D Flic’s main financial backers—announced that Resident Evil: Afterlife, a 3D Canadian-German co-production shot and edited entirely in the GTA, surpassed the venerable Porky’s as the top grossing Canadian film of all time. That might be a fluke, or it might be a sign of things to come: research takes time, and 3D Flic is less than a year old. Whether they’ll deliver on their promise to turn Toronto into a hub for stereoscopic cinema is, for now, anyone’s guess; prediction is a murky science at best, at least until the development of 4D technology allows us to see into the future.